31 October ought to be best associated with Martin Luther. 31 October 1517 was when Luther nailed up his 95 theses. He died about 100 years before the Second Reformation in Scotland and the rest of Britain. How could he possibly have a role in it? Further, Luther’s convictions on the Lord’s Supper, church order and worship weren’t those established by the Second Reformation. Looking back from the time of the Second Reformation in Scotland, John Row wrote warmly of Luther. He said that “the Lord, by his Word and Spirit, taught him more and more grounds of true religion, which he set out to the view of the world”. The point is that Luther sought to recover biblical Christianity. He did so by an appeal to the supreme authority of Scripture. In the Second Reformation in Scotland, we see the culmination of this outworking. Luther said to the Emperor: “I consider myself convicted by the testimony of Holy Scripture, which is my basis; my conscience is captive to the Word of God”. This was a vital principle. God alone is Lord of the conscience and Scripture is the only rule in matters of faith and practice. The men of the Second Reformation were willing to assert this resolutely in the face of the tyranny of absolute monarchy. It was this principle that the Westminster Assembly were committed to working out fully. An article on this site explains a little more of this. 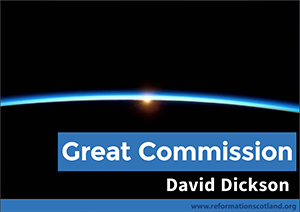 The Second Reformation applied the principles of God’s Word to both Church and Nation. Scotland flourished under God’s blessing as a consequence. One could say that it was biblical Christianity come into its own – its natural outworking. You can read some more here about why need the biblical accuracy of the Second Reformation in our day. There are 7 reasons why we need to learn from it. You can also read more about the principles of the Second Reformation here.